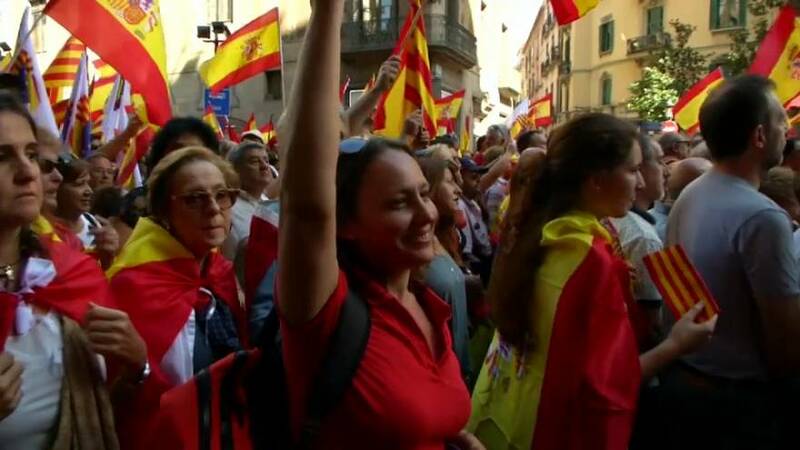 Olga Demestres woke up early on Sunday in order to take part in the Spanish unity protests in Barcelona. She is a Catalan who lives in Madrid. Although she thinks the central government shares responsibility for the current political crisis, she is against the push for independence by the Catalan authorities. Olga’s partner is from Madrid, but she wants to preserve Catalan culture in her family. “I speak to my son in Catalan because it’s my language, I speak with my family in Catalan and I believe that the culture is not solely the property of the independence movement,” she said. conversations about politics have become impossible. Around a dozen coaches financed by the pro-unity Catalan Civil Society left the Spanish capital in the early hours for the long overnight journey. After more than 600 kilometers and nine hours on the road Olga arrived in Barcelona. Delighted by the large crowds, she tells us her single wish is that the protest passes off peacefully. Olga blames the current constitutional crisis, the worst since an attempted coup in 1981, on the Catalan authorities but believes the situation is finally being reversed. But despite such people power, Catalonia remains on the brink of unilaterally declaring independence from the rest of Spain. All eyes are now on Catalan President Carles Puigdemont and what he will do next.